Before our trip to Disney last week I must have read every travel guide and website I could get my hands on. I loved preparing for the trip, and I put so much work into it I thought that I would share some of my favorite tips in hopes that it helps some of you who may be planning a visit. It's a different trip when you're planning for two toddlers (our little Owen, age 2 1/2, and our nephew Noah, who is almost 4). I'll tell you what worked and what didn't for our family. If you're interested, this is our Disney Master Itinerary. I carried around a copy of this where ever we went and it came in handy many, many times. My best packing tip is to think through what you need starting with your feet and working your way up to your head. Here's our Disney Packing Lists (with lists for the trip, plane and park). 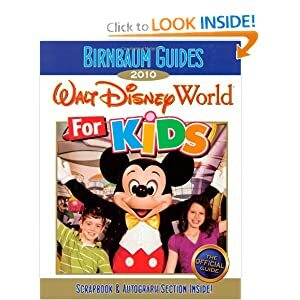 Birnbaum's 2010 Walt Disney World for Kids: This was a great book written for kids, by kids. I didn't actually read it to Owen because it's written for an older audience (about 6-13 year olds), but I took a lot of the advice to heart and Owen loved the pictures. 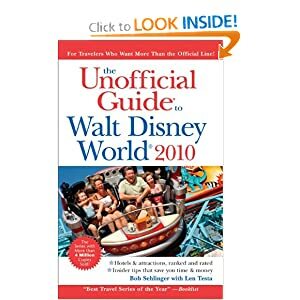 The Unofficial Guide to Walt Disney World 2010: By far the best guide book I read! There's a ton of detailed information about every single thing you might want to know. It's not written with a bias like many of the guide books... the authors are real and they tell you what will really work and what's not worth your time! MouseSavers.com- Great section on free stuff to do on your "down" days that don't require a ticket to the park, coupons and insider info that is updated constantly. Disney Mom's Panel- A million and one questions only moms would think up with excellent answers. Disney Park Hours- Type in your dates and your park of choice and Disney will give you the schedule of events for that day. Very helpful in planning what time to go and when to leave the park for nap time before heading back for fireworks and the parade. The biggest debate is whether or not you should bring your own stroller or rent one at the park. It's hard to find a picture of the park stroller, so I took one for you. This is a double stroller. The pros of renting it: it's sturdy. That's about it. It has horrible storage, it's hard to find when you get out of a ride because everyone's looks alike, it doesn't recline for sleepy ones, it's expensive and it's not good for kids under 2 because of the poor support. There... that's my opinion! Rather than rent one, we brought our own. A huge plus to that is the fact that you'll have a stroller on the plane and on your days away from the park. We just wheeled ours right up to the gate of the airplane and checked it at the gate, then it was waiting for us as soon as we stepped off of the airplane! It's also nice because you're not allowed to take rented strollers on the Disney train (at Magic Kingdom) and we used the train a bunch to get around once we were in the park. Another thing to think about are your "down" days. We opted for a character breakfast at the Contemporary Resort (they call it "Chef Mickey"). When choosing a character breakfast, choose it based on the characters that will be there and the price. While it was a nice time to meet each of the characters because they came to your table and spent one-on-one time with each person, it was super expensive and the kids can see the characters at the parks for "free". The food wasn't that great either for the price. If you're opting for a park hopper pass, I think the best place to see the characters would be at Epcot. I wouldn't suggest Epcot for little ones, but if you have a park hopper pass (allowing you to move from park to park throughout the day) I would suggest coming to Epcot after your nap time in the later afternoon. Then you could see the characters and stick around for Epcot's fabulous light and firework show. Our favorite "down" day activity was taking the monorail around to each of the different resorts and touring them, then going to downtown Disney for dinner or lunch at Earl of Sandwich. Both activities do not require a park pass and are free for touring. Downtown Disney has a ton of great activities and shops for a rainy day too. What tips do you have? What questions do you have? I'd love to hear from you! Hey Sarah! Your trip sounds like a blast :) Thanks for all the tips; we're considering a Disney Trip in the next year or so. BTW, you look so beautiful!! It sounds like you had a great time. We did Disney World two years ago. It's so big I found it to be overwhelming. I wish I had studied up before going. Thanks for the tips, we may go back again in a couple years.